When a well-respected video game journalist compares a brand-new game to one of the greatest stories ever in gaming, then it’s something worth paying attention to. That’s exactly what happened as reviews for God of War began hitting the internet on April 12, and Kotaku’s Jason Schreier compared the relationship of its core characters — Kratos and his son Atreus — to Joel and Ellie from The Last of Us. God of War is the first game in the franchise since 2013 and serves as both a continuation and a soft reboot. Kratos has left the world of Greek mythology and entered a Norse realm. After years of killing gods and participating in orgies, he’s got a son and has to become more of a legitimate hero, which is a huge upgrade for a formerly crude franchise. By all accounts, this shift in focus does wonders for the game. 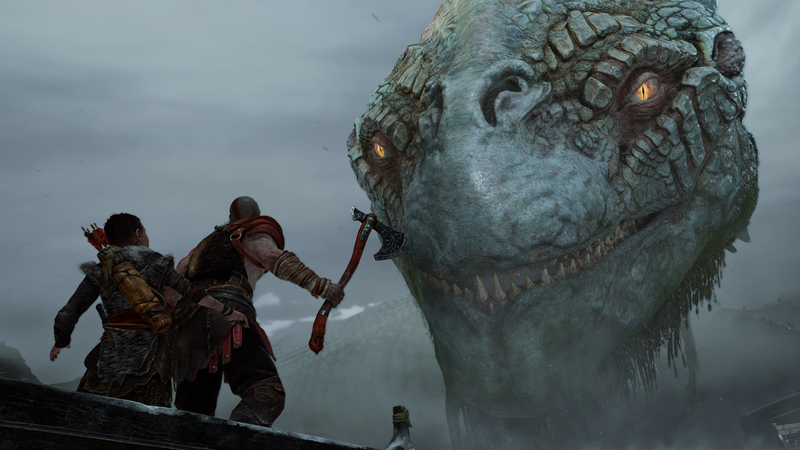 Kratos and Atreus encounter a fearsome-looking monster in 'God of War'. It would seem that by focusing on the relationship between Kratos and Atreus rather than the orgies and extreme gore of yesteryear, this new God of War game pivots the franchise in a new direction. The Last of Us might be a decidedly different story, in which a grizzled man loses his daughter in a zombie outbreak and connects with a girl he’s tasked with protecting years later. The way Joel and Ellie’s relationship evolves over time remains some of the best storytelling in gaming, so if God of War’s drawing comparisons like this, then it just might become one of the best games of the year. God of War will be released exclusively for PlayStation 4 on April 20.